If you haven’t heard about ‘Location-based metadata defaults’ or ‘Column default value settings’ then I hope to explain it simply. Try to think of it as a rather cool way to apply default values for your documents metadata (columns) based on which document library folder you are saving them to. For example, if you save a document to a folder called ‘Human Resources’ then you can automatically (assuming you have one) set a default value for a ‘department’ column to ‘HR’. It’s possible to have multiple column defaults. It’s also important to note that columns brought in by virtue of a content type can also be defaulted in exactly the same way as if they were a normal list column. Why bother with document metadata ? Search can be configured to use the metadata columns. Navigation can be driven from metadata columns – see this post. Workflow can be developed to uses these metadata columns. If you rely on humans to manage metadata … some will get missed. Humans aren’t as good as an automated process. 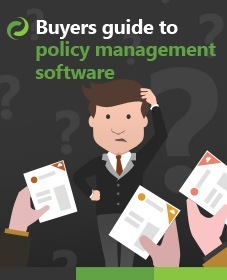 If you can tag your policies in an automated fashion this will be accurate and save time! So, how do you set this up ? 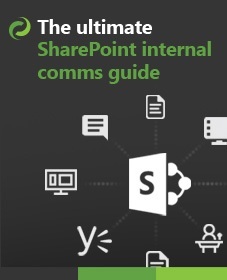 The following steps give you a very quick overview on how to configure the default column values feature in SharePoint. 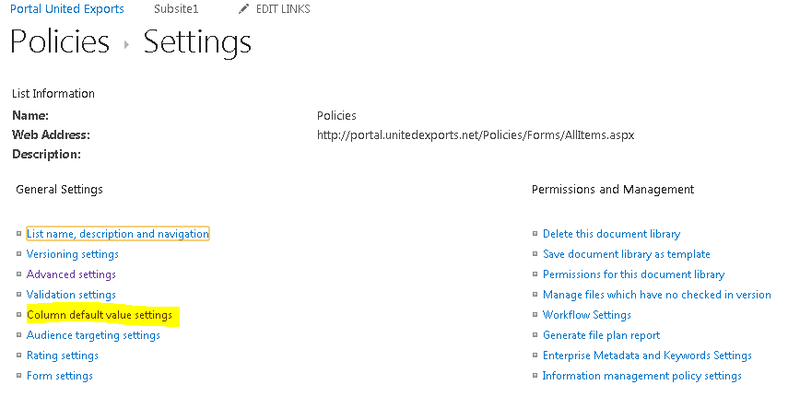 (These screenshots are for SharePoint 2013, but it’s almost identical in 2010). If you are using content types within your document library, make sure you have added it to the list. My content type is called ‘PolicyOrProcedure’ and is extremely simple, as it contains two columns ‘Policy Department’ to store the department owning the policy and ‘Project code’ which is an internal project code that links into the larger project that created the policy. These are purely for illustration and it’s likely that your own content type will be far richer. This will load the ‘Change Default Column Values’ screen. On the left hand side you will see the folders in your document library. Clicking them will allow you set ‘defaults’ at that level. By default, the default values will be inherited from the parent folder but can also be overridden at any sub folder level. Now, finally go and add a document into different folders and you will see that the default values get set based on where you save it to. Magic! I need help building this type of list.